An overview of the scene of a bomb blast outside a hospital in Quetta, Pakistan, August 8, 2016. Health officials say Monday's powerful suicide blast at a hospital complex in the southwestern Pakistani city of Quetta killed at least 70 people and wounded 112 others. The blast occurred shortly after dozens of lawyers gathered in Quetta's Civil Hospital to protest and mourn the killing of their provincial bar association’s president in an early morning drive-by shooting by unknown gunmen. Most of the bombing victims were lawyers. Journalists and television cameramen covering the lawyers’ rally were also among those killed and wounded. A splinter faction of the extremist Pakistani Taliban, Jamaat-ul-Ahrar (JuA) claimed responsibility for both killing the bar association president and the subsequent deadly bombing. A spokesman for the group said that a suicide bomber was deployed at the hospital anticipating lawyers and government officials would gather in large numbers. There was no independent confirmation of the claim. JuA claimed responsibility for an Easter attack in the second largest Pakistani city of Lahore in March in which more than 70 people were killed. The United States last week designated JuA as a global terrorist organization. The Islamic State group also later issued its own claim of responsibility for the hospital bombing. 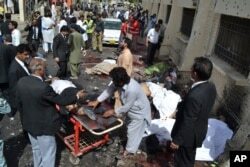 Speaking to VOA, the provincial government spokesman, Anwar ul-Haq Kakar gave details of Monday's attack in Quetta. People help victims of a bomb blast in Quetta, Pakistan, Monday, Aug. 8, 2016. Provincial government and officials of the bomb disposal squad in Quetta have now confirmed the attack was carried out by a suicide bomber, saying they have recovered head and legs of the attacker form the site of the blast. Government spokesman Kakar said the violence appeared to be in a reaction to Pakistan’s counter-terrorism and counter-extremism efforts. “The same terrorist groups which are religious and sectarian-inspired, we are suspecting that they are behind such heinous acts,” he said. In Washington, the U.S. State Department condemned "in the strongest terms" Monday's attack in Quetta. "Today, terrorists targeted a hospital, as well as the judiciary and the media, two of the most important pillars of every democracy," a statement said. "These brutal and senseless attacks only deepen our shared resolve to defeat terrorism around the world and we will continue to work with our partners in Pakistan and across the region to combat the threat of terrorism." At the United Nations, a statement by Secretary-General Ban Ki Moon said "the targeting of mourners at a civilian hospital makes the attack particularly appalling." Quetta is the capital of Baluchistan province, where ethnic Baloch separatists and religious extremists routinely carry out such attacks.